I have a Windows 7 PC, and a Windows 10 Laptop for testing all the preview builds. I have been staring at the desktop’s GWX app which has been sitting quietly on the system tray, ever since the day it first appeared. (Wake up and tell me Windows 10 is ready to download.) I knew I could manually trigger the download, but I just wanted the app to give me the good news, it really would have been a special moment. Alas! My patience ran out today, and I tried to force the update by entering the “wuauclt.exe /updatenow” command from an elevated command prompt, and then checking for Windows Updates. After that process came to no avail, the next step was to obviously try the Windows 10 downloader tool from Microsoft, and running the Media Creation Tool threw out the “Something Happened” message. That was really helpful Microsoft, thank you. So, what now? No we don’t, its actually pretty easy to solve the issue. All you have to do is follow the steps below, which I came across at this thread on Reddit. 3. 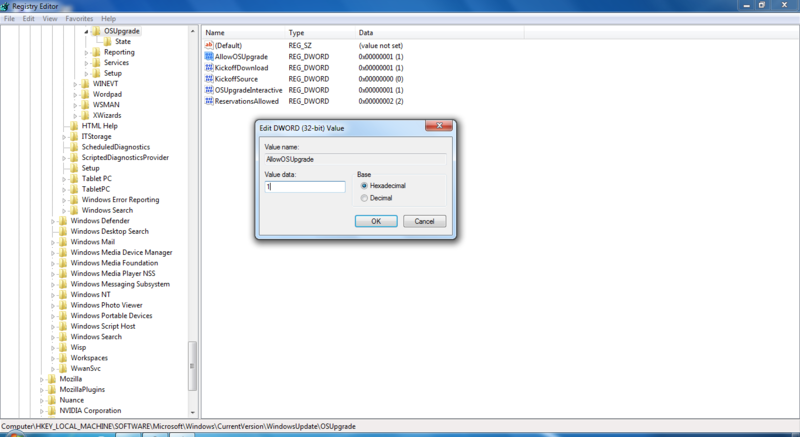 Right click on the pane on the right hand side, and create a New -> DWORD (32-bit) value. 4. Assign the following name to it. It is case sensitive, so copy and paste it as given below. 6. Now you can close the Registry Editor. 7. Navigate to Start > All programs > Windows Update. Wait for it to finish checking for updates, and et voilà! You should a screen like the one below, which says Windows 10 is ready for download. Click on download and you should be good to go. Windows 10 is currently downloading on my computer, and should be ready for installation quite soon. Hope this helped you too. Thank you very much for help. This instruction is awesome. Thank you so much for posting – it works for me, at least as far as its downloading! Enjoyed reading your upgrade directions Ashwin. Thank you Ashwin. Finally this article helped! Keep up the good work mate. Is it normal that the windows update search last a very long time ? The four steps given in the 2nd step and the 9th step alone could solve it too. Did you reserve the upgrade using the GWX app? As far as I can tell, the OSUpgrade keys are created by the GWX app. If you didn’t reserve the upgrade you may not have it. How to get the GWX app? I Use media creation tool, but it’s not work. Could you elaborate? What is your OS edition, and did you reserve the upgrade before trying this? It seems to be working, I had to re-check for updatres to get the windows 10 update to work. Thanks! The key element for this instruction is that even after the registry edits have been completed, one needs to click on the “Check for Updates” Link in the Windows Update interface. Before I did that, this solution was going nowhere! The new Media Creation Tool definitely has problems and whoever created that error message should be summarily shot. Yes, that is what step 7 is for :). Microsoft really did make a mess with the upgradation process. Thank you for posting this version. I too was having the issue with the new version but it appears to be working with your posted version. This did it! Thank you very much. I tried all the other fixes and nothing worked. this is the solution. the old media creation tool. 10x a lot. Thanks my Dear! You saved my life! I also tried every fix I could find for this problem. Nothing worked. The older version of the media creation tool linked above worked fine! “Something Happened 0x80070002 – 0x20016” – WOW!! What a classic! it seemed to be working then it said you cant install windows 10 because your processor doesn’t support PrefetchW. does that mean i cant have windows 10 at all on this pc? What is the bit architecture of your Windows , and what processor does your PC have? This page at the Microsoft forums says, that your processor doesn’t support PrefetchW http://answers.microsoft.com/en-us/windows/forum/windows8_1-windows_install/error-processor-does-not-support-windows-81/effea756-e5ec-4dee-a615-38b3fac02598. Edit: Of course you will need to format Windows and install Windows 7 32-bit, and then upgrade to Windows 10 32-bit. If you have more than 3GB RAM, it is not worth downgrading to 32-bit. thank you. it looks like ill probably just start building a new pc soon. And if I may, I suggest you try a demo of Windows 10 at a retail store or a VM, before building a PC for Windows 10. Just to make sure you like the new OS. So, even creating the registry key and then checking for updates didn’t work? If possible could you upload a screenshot of the registry entries for “OSUpgrade” at imgur or a similar website ? Is it problem that i have Windows Embedded 8.1. Industry Pro from Dreamspark? As i read, that was not the problem… Thank you for your time! Like i told u i have Windows 10 reserved on windows update but not with option to install..
Just to correct that my ReservationsAllowed was set to 1, and i turned it again to 1 and i see again the Windows10 reservation. IF any error please fix with Microsoft Fixing tool. it will work and worked for me. I am running Windows 7 with Service Pack 1. I followed your instructions but was not able to find “OSUpgrade” folder in Registry Editor. Do i have to create as well or am i missing something? I think the folder is only created for those who reserved the upgrade. Did you reserve it? Is yours a 64-bit OS too? Ok, I confused the dreamspark issue with the Prefetch problem. Please ignore it. Now, did you reserve the Windows 10 upgrade prior to creating the registry keys? I’m trying to find out more about this. Dreamspark’s website says that the Windows 10 upgrade is free. Have you tried installing all Windows updates (including optional ones)? This post on the Microsoft forum says that all Dreamspark users have only managed to get the Reservation app to work, but they haven’t received the update. But, many users on Reddit have reported that the Windows 10 ISOs are available at the Dreamspark hub. Try logging in to yours to see if it is available, and upgrade using it. Thanks a lot! It worked wonderful! Does the 32 bit file matter depending on how many bits your PC is. Mine is 64 bits so I want to make sure. You can only upgrade from the bit architecture of your Windows to the same on Windows 10. For e.g: If your PC is running Windows 7 64-bit, you can only update to Windows 10 64-bit. I’m trying to upgrade a system that was originally XP, upgraded to 7. I get “Something Happened” in a pop up box after it runs the whole upgrade process. I have a 64 bit AMD Phenom II system. It passed the pre-upgrade checks. I’ve disabled AV, unplugged all extra peripherals and tried a clean boot. Any ideas for me? The 32-bit value is enough. The C19001DF has been reported by many users at the Microsoft forums, I’ll let you know if I find a fix. Worked for me! Thanks a bunch! This was very helpful! Thanks a million! Did you reserve the upgrade? Do you have the Windows logo on the System Tray? It is the Windows Reservation App, you can check your reservation status using the app. Did you reserve the update before July 29th? Thank you, finally solved my problem after trying various fixes found somewhere else on the internet! PERFECT!! It had been driving me nuts! Thank you!!! Followed your instructions & for once it all worked well so thank you very much for making so simple to follow. Did you try creating a bootable USB/DVD and updating using that? It might help. Even a 4GB pen drive would do. Just use the media creation tool, and select the option to “create installation media for another PC”. This will save the Windows 10 installer to the pen drive. The advantage to this is, you can use the media drive any number of times, and even use it to upgrade other PCs, without re-downloading Windows 10 each time. mmm… i have the issue with windows 10 pre-build 10122… i got the error.. and tried your way. I just COULD NOT find the “OSupdate” part in the path! any help? This way worked via windows update. I was waiting to get the ”download” but this made it pop up. Thanks. I don’t have OSUpragade. Why? Try installing all Windows Updates, including optional ones. That was simple. After going through multiple web site solutions and being frustrated your solution fixed the problem in a few minutes. Great!!! Work fine!! Thanks bro!! Amazing. Your instructions was spot on. Thanks for your help. I finally became Windows can install 10. Thank you very much. You fixed it ! ALL I can say is I LOVE YOU MAN!!! You are the greatest! I don’t ahve OSUpgrade under WindowsUpdate. Also I need 64bit one, do I still need 32 DWORD? bei mir ist der Ordner OSUpgrade nicht vorhanden 🙁 Kann mir wer bitte hlfen 🙂 ???? Guten tag. My German isn’t that good, so I’ll use Google Translate. Worked like a charm, I had to restart the machine after adding registry key and Bingo!! Thank you. There are so many other so called “fixes” out there, none of which have worked in our situation. But yours finally allowed the upgrade to complete! Thanks buddy, very good information. Worked like a charm. so simple! I have corporative win 8.1 on desktop and your advice was the magic solution for the Update to win 10!!! Thank you so much! Very grateful!! Thankyou again! Help me please. If I have not a the path OSUpgrade. What I need to do? Check for, and install all optional Windows Updates. Thanks for suggestion it’s working for me….. Thanks a lot.. I tried different methods which I read in several other websites. None of them worked.. This is perfect.. thanks for sharing.. Spent several hours looking for a solution. This did the trick. For those of you who aren’t comfortable with regedit, because yes you can break your OS if you’re not careful, I’ve created and backed up the registry edit for a Windows 7 machine. You can dowload it here, https://dl.dropboxusercontent.com/u/66162661/AllowOSUpgradeW7.reg. Double click the file and accept the install. This bypasses steps 1-6 and you will begin at step 7. I don’t have access to a windows 8 machine so I’m not sure if this is stored in the same location, but I will upload that registry file if it is different.. Thank you, this works like a charm! I don’t have OSUpgrade , what can i do ? Install all Windows Updates, including any optional ones. WOW! You rock! It really worked, although I was sceptical. Spend so much time looking for a solution and trying various things without result. till I found yours. Thanks for posting this great article! I followed the instruction. and previously undates was not showing windows 10 but it show the option to upgrade. However when it completed downloading it showed installing and suddenly again it started downloading 2699 MB file for the windows 10. Better choose the second option in the Media creation tool, which allows you to make a bootable USB/DVD. I have windows 8.1 64bits.I followed the instructions and when I run the Media Creation Tool it doesn’t work any more, and when I run the windows update it shows no updates available. Try the older Media creation tool, linked in a comment above. I don’t have any OSUpgrade folder! Great help, worked like a charm. Thanks. The OSUpgrade folder is not there if anyone else has this problem and figured it out please help. Have you installed all Windows Updates, including optional ones? There is no OSupdate on my registry, please help? Even after installing all updates to my computer, it is fully updated and there is no optional updates left to install. Awesome find. Been fighting WIndows Pre Updates that have been failing disallowing Windows 10 upgrade. I did add the regkey but I still get ‘Something Happened’ error. Any other thoughts. Thanks for your help. Try the older version of the Media Creation Tool linked in the comments. Thank you so much! I’ve tried a lot of other things and nothing worked until this. I have dell latitude d430 model. It has 2Gb Ram,1.33 Ghz Processor,80Gb Hard Drive and Direct X 11. This system is currently running in Window 7 Professional 32 Bit with Genuine Windows. I have already registered for Windows 10 Free upgrade and getting Popup. However, if i run the upgrade, am getting Window 10 Pro update failed. I tried using Media Creation Tool and getting ething happened 0x80070002 – 0x20016. I also verified the regedit for AllowOSUpgrade and value is 1. Please help me to install Windows 10 in my laptop. Thanks. Hi Prabhu, use the older version of the media creation tool linked in the comments. I have a Dell Vostro 200 and Windows 10 upgrade says it is not compatible. Apparently it lacks some basic instruction set. Yours might be the same problem in another guise. Thank you so much. I had given up hope having spent hours doing everything Microsoft suggested, even reinstalling Windows7. I thought I’d take one last look !! I have 6 older PCs to upgrade which this will fix !! I have Windows Embadded 8.1 Industry Pro OS and I wanted to force the update, but after the “Something happend…” messega I started to search some solution. I found ur guide and I done it but it didn’t work for me. Do u have any other idea to solve the problem? Dreamspark user? Many users have only managed to get the Reservation app to work, but they haven’t received the update. You can try logging in to your hub and download the ISO directly. Can I have the older version of media creation tool for 32 bit ? In my pc, Get Windows 10 app saying that This pc can’t run windows 10, This CPU is not supported. I have been trying lot of things but had hard luck to get any solution. Does your PC meet the system requirements listed at http://www.microsoft.com/en-in/windows/windows-10-specifications ? Thank you very very very much! 😀 this work for me, on a domain stationwork ! Good luck man from Uruguay! i can’t find OSUpgrade in register!! please help! not happening with this too. pls help me!! !